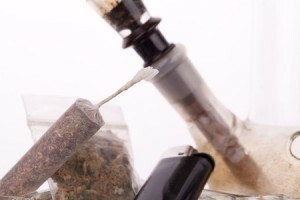 Tahlequah Attorney BlogIn Tahlequah, What is Possession of Drug Paraphernalia? Drugs — their possession, use, manufacturing, and distribution are strictly forbidden in Tahlequah, Oklahoma. In fact, Oklahoma has some of the harshest penalties in the land for drug offenses of any kind, including the possession of drug paraphernalia. It is common for a person to be charged both with possession of a substance and possession of drug paraphernalia. For example, a marijuana joint and a roach clip are often used together. Interestingly, not all types of drug paraphernalia are illegal. For example, a person can use a syringe to take insulin. In that case, the syringe is legal since its intended use is legal. The same syringe would be illegal if it were to be used to shoot up heroin or any other illegal controlled substance. In defining whether an object is legal or illegal, you must look to its intended or actual use. A bong or a roach clip is seldom used with a legal substance, so these almost certainly would be considered illegal. However, the syringe referenced above would be legal if used with a legally prescribed medication such as insulin, and most certainly illegal if it were to be used with any illegal controlled substance. Most defenses to possession of drug paraphernalia charges revolve around the answer to the question of intended use. Sometimes, intended use can be easily inferred from the drugs found in your possession. Sometimes, intended use is more elusive and subject to more interpretation. For example, a product’s instructions may point toward a strictly legal use, and a skillful attorney may be able to form a defense from printed instructions. You may be required to testify as to your intended use. Likewise, the prosecution or the defense may call an expert to testify regarding the typical use for a particular product. A first-time conviction of possession of drug paraphernalia is a misdemeanor in Oklahoma. If convicted, you could face a year in jail and up to a $1,000 fine. Fines escalate with each subsequent conviction, and can go up to $10,000. Please contact a Tahlequah criminal defense lawyer to discuss your available legal options if you’ve been charged with possession of drug paraphernalia in Oklahoma. For a free consultation, call the Wirth Law Office – Tahlequah at 918-458-2677 or toll free at 888-447-7262. Or, if you prefer e-mail, you may enter a legal question in the form at the top right of this page and we’ll contact you by e-mail as soon as possible.